MEYLE engine and transmission parts – for perpetual motion. Make every van a well-oiled machine: We offer 51 exclusive and environmentally friendly full-service kits for the automatic transmission fluid change catering for more than 5,000 vehicle applications equipped with all popular transmission types. Sourcing all parts as a kit from a single supplier guarantees car owners excellent service while repair professionals benefit from time and cost savings. 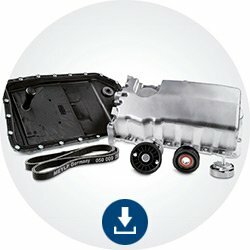 Change on the fly: MEYLE oil change kits for van automatic transmissions. Exclusive oil change kits containing all parts required for swift oil change to professional standards. Watch this video to see how easy it is to assemble a MEYLE oil change kit. about engine and transmission as download files.